Moving into 2019, I plan on sharing a lot more stories about the projects my team does all the time. To keep my skills sharp as a wedding industry professional, I regularly plan collaborative styled wedding shoots based around a centralized theme, both to push myself creatively, and to show brides-to-be just how beautiful weddings can be when you stick to a theme. They create stories that are memorable enough to tell again and again. Here’s the first of many stories to come — imagine if this were your wedding story! This November, I teamed up with Gold Crown Events and Michael Burgan to organize a large styled shoot involving multiple vendors in the Charlotte area, all partnering for a singular goal: to create a beautiful wedding scene that spoke “ROYALTY” in every sense. The outcome was spectacular! For this royal endeavor, we knew that we needed to convey a few things: elegance, opulence and class. First, we selected The Palmer Building, because it’s historic architecture lends itself quite nicely to the ‘castle’ feel needed to pull off the royalty motif. Next, we found four experienced models that would worked perfectly to conveying the mood, and we adorned each with a custom-designed, handcrafted gown fit for a queen. Then, we put our male, ‘King Luke,’ in a tuxedo with a full long tailcoat, and he played the part perfectly. Gold Crown Events handcrafted each of our intricate, ornate accessories, just as they do for their clients, in addition to the legwork of coordinating over a dozen vendors, and the logistical details. 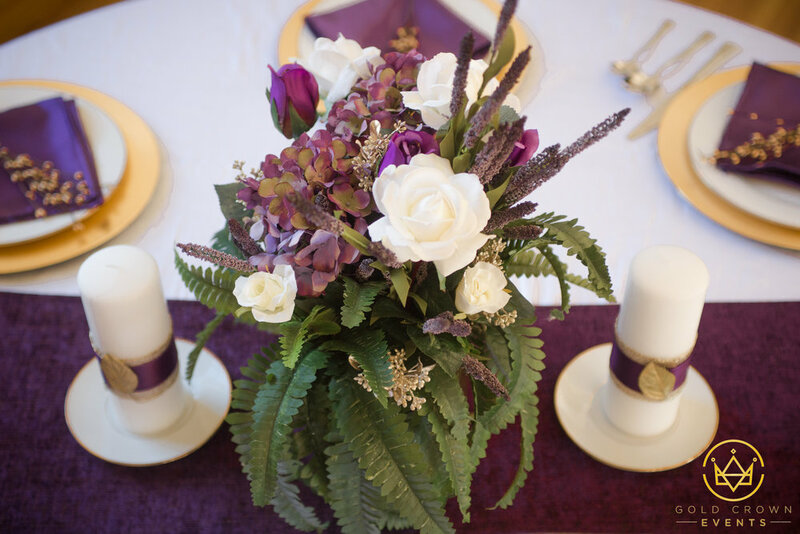 We decided very early on on a color scheme befitting of royalty, a deep purple and a rich gold. 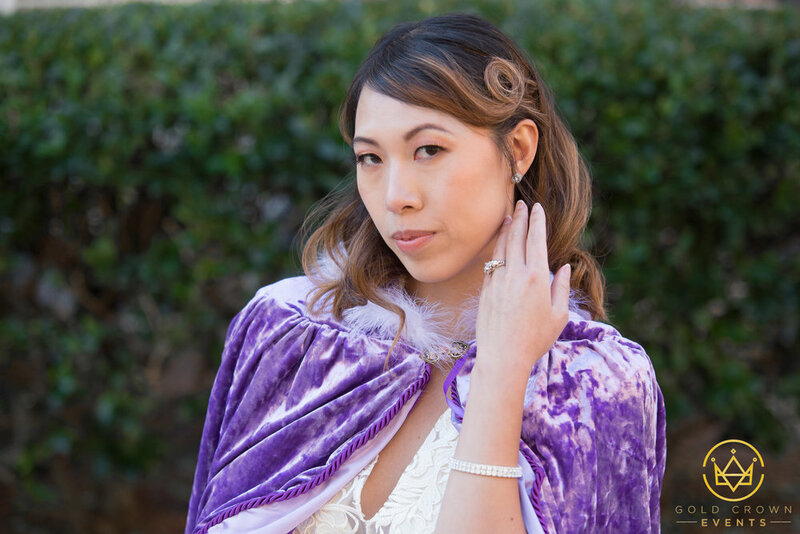 Gold Crown Events used soft fabrics such as velvet for the royal musts, like Christina’s smooth light purple royal cape, to add a touch of plushness to the visuals. And royalty has always been about sheer opulence, as demonstrated by King Luke’s “Game of Thrones”-inspired dragon-scaled cape. Luke proudly displayed his royal finest like it was handmade for him — which it was! So how did it turn out? Our royally-styled brides did a phenomenal job of portraying the air that they’ve lived in the lap of luxury for a lifetime, used to having nice things. King Luke and Queen Mandy (a real-life, so-in-love couple) had no trouble being just what they were: so in love. Pictured, from L to R: Christina Leung, Jesyka Noelle, Luke Jarvis, Mandy Jean and Caroline Kelly. Before we put this together, I’d never seen a styled shoot with four different brides, but that's exactly why we wanted to try something a little different. So we envisioned a royal castle where King Luke and Mandy presided, inviting in queens from other friendly allied nations. All of our brides, Christina, Caroline and Jesyka, were incredibly convincing, each a royal bride in her own right. Several vendors collaborated with us for this event. Gold Crown Events, Elegance by Olive, Michael Burgan and Viva Boutique each provided bridal gowns to the event. Gold Crown Events took the lead on providing accessories that fit the bill for the royalty motif, as well as handcrafting the floral arrangements for this event. Clearly, we had a lot of talent from a lot of talented participants, but our shoot also had a lot of luck, with the weather not only cooperating, but giving us a sunny day, with beautiful blue skies. Mother Nature provided the rare 60-degree day in mid-November, after a full week of cold and rain here in Charlotte, and we were happy to take advantage. What do you think of the Royal Styled Shoot? Did you participate in the shoot as a model or vendor? Brides, did Royal inspire any ideas for your wedding? Feel free to share your experience below. Thank you!